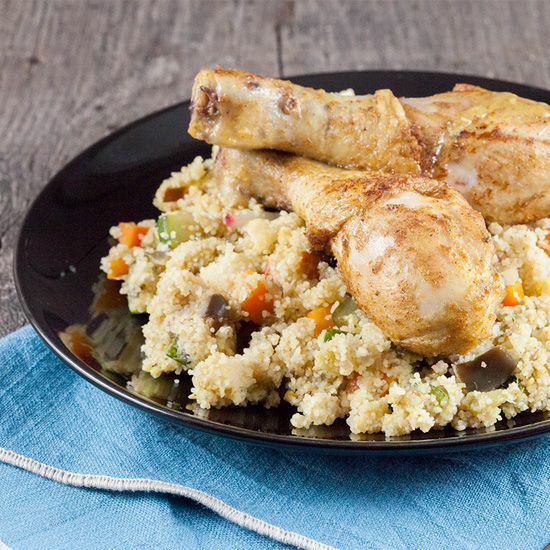 Couscous with veggies and chicken legs are a perfect weekday meal. Filled with lots of herbs and veggies, and ready in a little more than half an hour. PEEL the carrot and chop into cubes. RINSE the eggplant and zucchini and also chop them into cubes. PEEL and finely chop the red onion and garlic cloves. REMOVE the green parts from the radishes and chop them into pieces. PEEL and finely grate the ginger root. HEAT up the vegetable stock. HEAT olive oil in the large skillet and saute the red onion and garlic for about a minute. Then ADD the carrot, zucchini and eggplant and cook them a few minutes more. ADD the chopped radishes. PAT the chicken legs dry using paper kitchen towels en season them with pepper, salt and about a tablespoon garam masala. 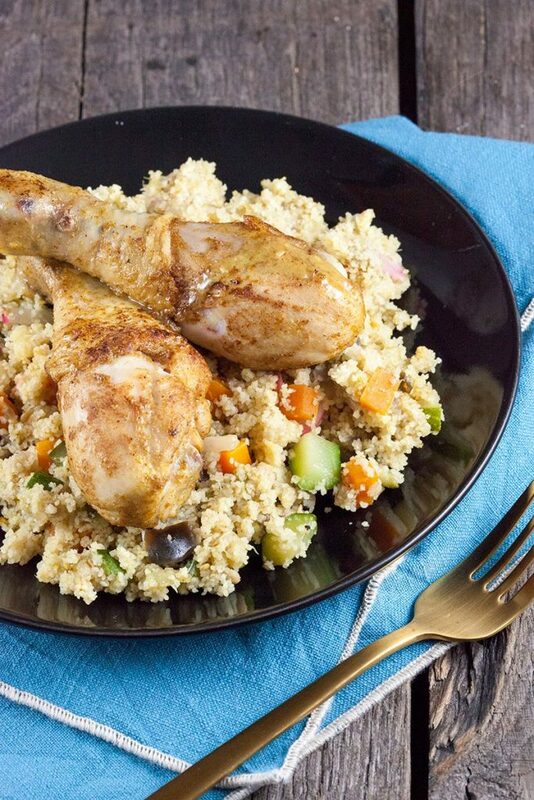 HEAT olive oil in the medium-sized skillet and cook the chicken legs on all sides until they’re golden brown. ADD a small layer of water to the pan, cover with a lid and let it cook on low heat. 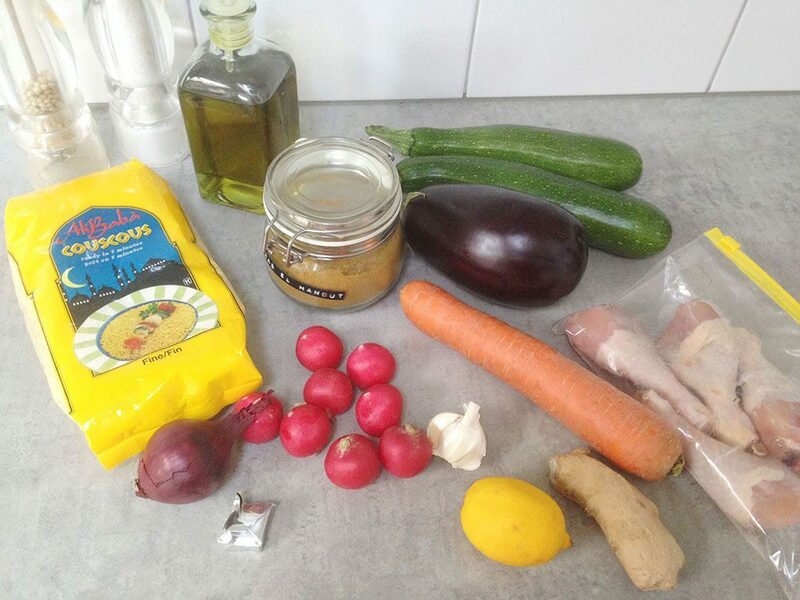 Meanwhile ADD the couscous to a bowl along with some olive oil, juice and zest of a lemon, a tablespoon garam masala, pepper and salt. 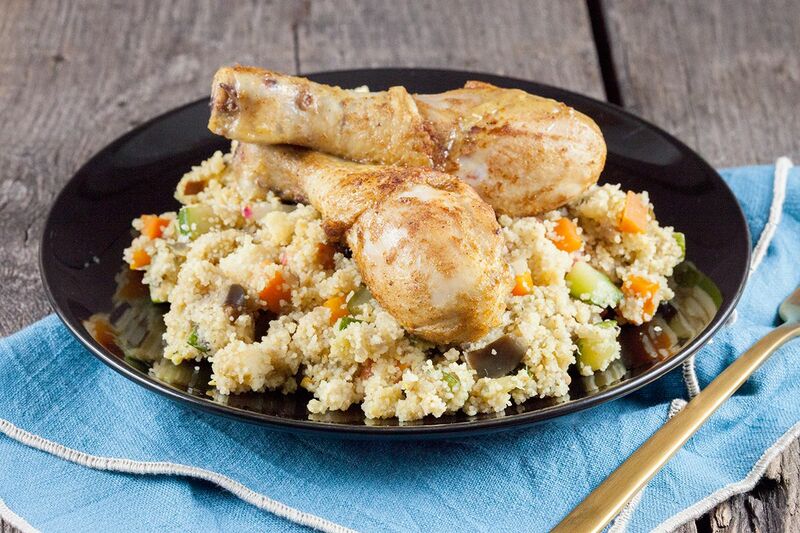 POUR the hot stock on top and stir well to prevent the couscous from creating lumps. COVER with cling film and let it steam for a few minutes. Then STIR again and add the couscous and grated ginger to the large skillet. SEASON with pepper, salt and maybe some more garam masala. SERVE with the chicken legs and enjoy!